Umesh picked all the three wickets in the morning session after the West Indies, who trail the two-match series 1-0, started on 295-7. 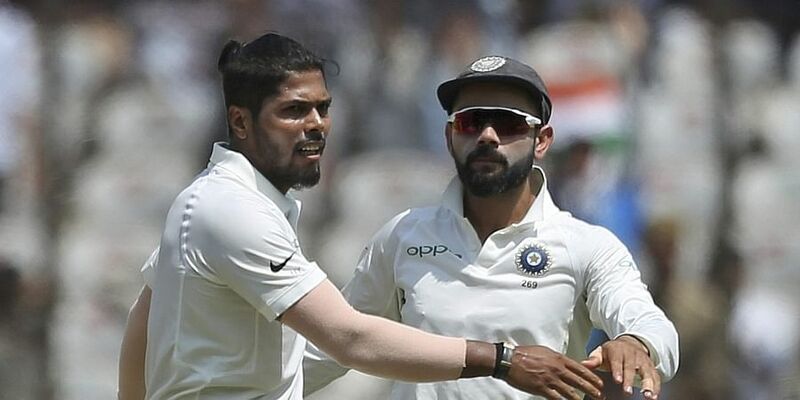 India paceman Umesh Yadav claimed six wickets to help dismiss West Indies for 311 after Roston Chase completed his century on day two of the second Test on Friday. Yadav returned career-best figures of 6-88 as the hosts bowled out the West Indiesearly in the morning session. The tourists survived 101.4 overs after electing to bat first in Hyderabad. Chase top-scored with a gritty 106 off 189 deliveries -- his fourth Test century. The overnight batsman was finally bowled by Umesh after starting the day on 98. Umesh, who had lost his pace partner in debutant Shardul Thakur early on day one, was ably supported by left-arm wrist spinner Kuldeep Yadav who claimed three wickets. Thakur suffered a groin strain in just his second over of the match and limped off the ground after bowling 10 deliveries. He was sent for scans and has not returned to the field since. The West Indies innings was largely built on the 104-run seventh-wicket stand between Chase and skipper Jason Holder, who made 52.